Almost four hundred years ago, the first permanent English settlement in North America was established along the James River, not far from the Chesapeake Bay. Jamestown has since become immortalized in history, with the names of Captain John Smith, John Rolfe, Chief Powhattan and his daughter Pocahontas indelibly linked to Jamestown Island. Today, Jamestown Island is home to both history and nature. Explore the remains of the "Old Towne", as well as the "New Towne" where colonists built more substantial homes after 1620. 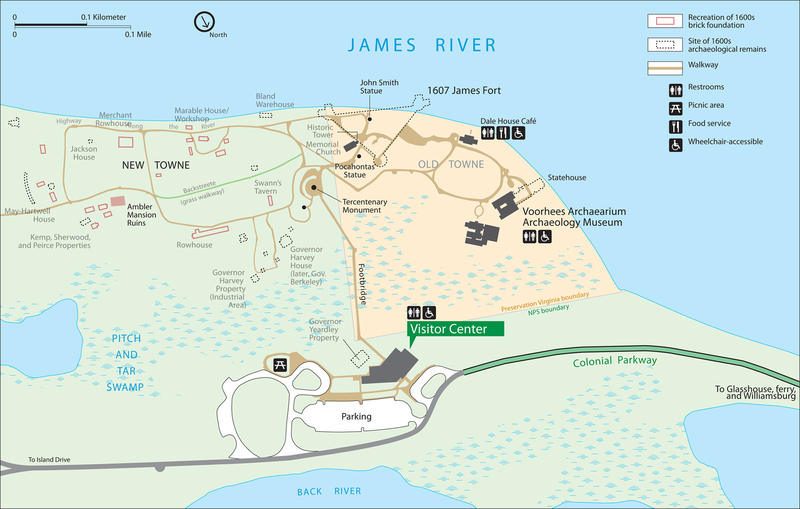 Jamestown Island is administered jointly by the Association for the Preservation of Virginia Antiquities and the National Park Service. Gate hours are from 8:30 a.m. - 4:30 p.m. Daily. No entrance is permitted prior to 8:30 a.m. or after 4:30 p.m. including bicyclists and pedestrians. $14 per adult (age 16 and above) - pass good for 7 Days to include Yorktown Battlefield. $30 Colonial National Historical Park Annual Pass - pass good for card bearer and three adults at Historic Jamestowne and Yorktown Battlefield for a 12 Month period : NOTE: All adults entering Historic Jamestowne on a Colonial Annual Pass will be charged an additional $5.00 per adult for each visit (Preservation Virginia fee). Visits to Yorktown Battlefield will be free for those 12 months. Stop at the Jamestown Visitor Center to pick up orientation materials and see a 15-minute introductory film and the museum exhibits. Ask at the front desk about ranger tours of the island, costumed interpreter programs, and children's activities. From the Visitor Center walk to "Old Towne" and "New Towne." Highlights of the "Old Towne" tour include the original 1639 church tower, current excavation of James Fort, Confederate earthworks, and the foundation of the Third and Fourth Statehouse. In the "New Towne" section of Jamestown, developed after 1620, foundations of many of homes and other buildings were excavated in the 1930s and 1950s. Replicas of these original foundations are scattered throughout the "New Towne" site. Drive and explore the island on the three- or five-mile wilderness loop drive. Herds of deer inhabit the dense forests around the pitch and tar swamp. Interpretive signs and paintings along the way discuss some of the early industries attempted by the English. Inside the reconstructed Glasshouse of 1608, skilled artisans produce glassware in much the same manner as did 17th-century craftsmen. The Visitor Center, Old Towne, and New Towne are wheelchair accessible, although assistance may be required on unpaved outdoor paths. In 1606, Captain John Smith began helping the London-based Virginia Company create a plan to colonize present-day Virginia and establish what would become Jamestown. Smith and his fellow colonists set sail from England in three tiny ships on December 20, 1606. They spent more than four months at sea and finally reached the shores of Virginia in April 1607. When they arrived, they opened a sealed box from the Virginia Company that revealed which seven men would govern Jamestown. Smith's name was on the list. This angered the “gentlemen” in the group who considered Smith’s yeoman background to be beneath them. Over the next few years, the challenge and stress of maintaining a food supply, avoiding illness, and carrying out the Virginia Company’s orders led to political infighting.